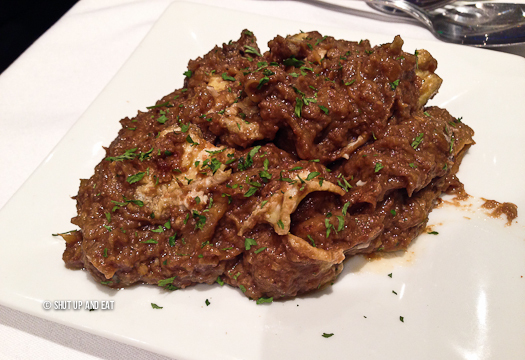 Persian Food in the West Island - Grill Select - Shut up and eat. When was the last time you were in the mood for Greek food but were also thinking, “hey you know what would be really good right now? Persian food!” I don’t know about you but when I’m in the middle of shcoffing an all dressed chicken pita, the one thing that’s on my mind is beef kebab. No, not really. But if you ever wanted to have both types of food at the same time, or are having trouble coming to an agreement on where to go eat with someone, there’s a solution for you. 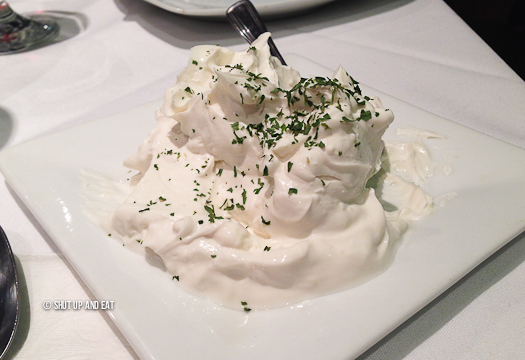 Located in a modest strip mall in Kirkland is Grill Select; Greek and Persian Cuisine. Yes I know, it sounds strange but hear me out. My sister who lives in the Westisland and who is deprived of any decent restaurant dining options in Kirkland, recently told me about this place serving Greek and Persian food. I was most fascinated about the Persian side of the menu. We ordered in and I thought it was pretty tasty, but I’m not an expert Persian food. I decided to check it out with the Shut Up and Eat’s resident Persian food advisor, my girlfriend. We started with a couple dips; the moosir. A Persian yogurt dip – that’s similar to tzatziki – that’s made with shallots instead of garlic, thus not much of a vampire repellant as the Greek variety. It was creamy and the flavour was subtle. 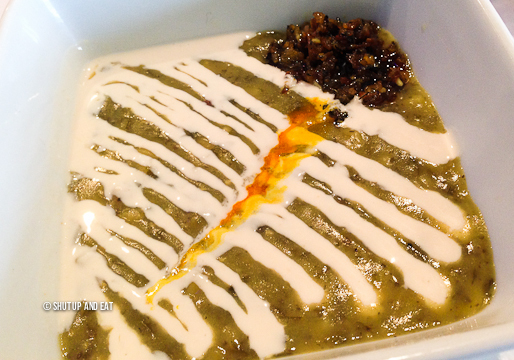 Mirza Ghassemi is a roasted eggplant and garlic dip with spiced with turmeric and mixed with fried eggs. It was tasty, but we found it a bit bitter. This could be attributed to have not bled the eggplant long enough to remove the phenolic acids that causes the bitterness, or it could have been bitter because of the fried garlic, or the combination of both. The dish was savoury and delicious; it was served with the buttered pita. The ash reshte is a traditional Persian soup. A thick noodle soup – fragrant in herbs like parsley dill – is made with lentils and chick peas, topped with kashk (whey), fried onions and fried mint oil. We had the Kabab Koobideh – Iran’s signature and most famous kabab. 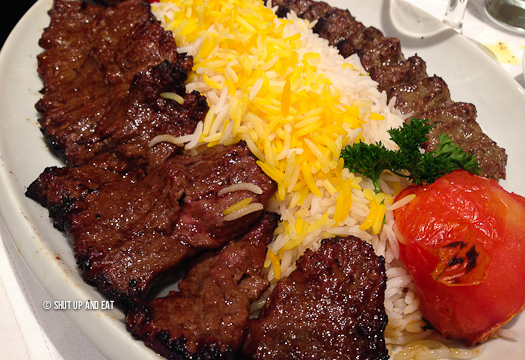 Two marinated beef brochettes grilled over fire served with saffron basmati rice and grilled tomatoes. The kababs had a nice thin char to it and the meat was “very juicy, much succulent.” The meat didn’t need a sauce and I found myself mixing the rice and eating it with the jus from the kabab. 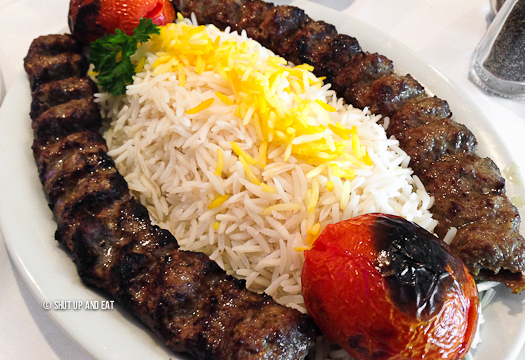 The Soltani or “King’s Choice” is a mix of the Kabab Koobideh and the Kabab Barg – a brochette of flattened filet mignon. The meat was fork tender (I barely needed a knife to cut the meat) and juicy. I was explained that traditionally, the filet mignon kababs are marinated in nothing more than just onion and may be dusted with some spices when being served. It was good; simple, nothing fancy, grilled filet mignon. The menu is all over the place, Greek, Persian, burgers, wings; but I get it; this restaurant is trying to appeal to all palates and tastes. The Persian dishes are solid and the owners are sitting on a great opportunity to introduce more people to this exotic cuisine… especially in the west island. I think that area of Montreal needs a place like this; a place that specializes in a particular cuisine and making it approachable and accessible to the west island; a taste of something different, something refreshing. I think it’s only a matter of time before they start phasing out some of the introductory filler menu items and start to focus on Persian cuisine, adding dishes like bademjan or fesenjan or other kababs and presenting a glorious plate of sabzi khordan with each meal. I’ve eaten here a few times and each time I couldn’t get past the Persian menu so I can’t comment about the Greek food. Bring your own wine. Previous post: 2015 Montreal Food Truck Seasons Starts This Friday!